Teaching them how to breathe and ground their energy. Armed with these new skills, many people find it easier to calm themselves, and they go on with life. Sometimes, though, there is no clear situation or event connected to the anxiety. People report feeling anxious most of the time, for no apparent reason. They get temporary relief from changing their thinking and doing their breathing and grounding exercises. But they quickly feel anxious again. When this happens, we have to dig a little deeper. I explain that people often learn to hold in disturbing emotions such as sadness, anger, or hurt. They’ve most likely been holding them in since childhood. They learned as children that expressing sadness, anger, and/or hurt resulted in being punished, ignored, or ridiculed. As a result, they learned to tense their bodies and hold their breath to keep the emotions from coming out. When people learn to unconsciously stay on guard against expressing these feelings and emotions, they may keep doing this for so long they become less aware that these feelings exist. But they are there, deeply held in the body and mind. When these repressed feelings begin to come to the surface in adulthood, an internal alarm goes off. “Dangerous emotions are about to erupt,” it warns. Current sad, difficult, or hurtful situations can all set off this “alarm.” All of these can trigger anxiety. Does this description resonate with you? If so, don’t despair. There is hope! It does take some effort and courage, but you can learn to change your automatic anxious response. You first have to learn to surrender. By doing so, you can learn to notice which emotions are beginning to emerge just before the anxiety starts. From there, you can learn to allow them, to (bravely) breathe through them until they’ve been fully expressed. Our bodies were made to experience a wide range of important emotions. When you surrender to the emotional experience, the “alarm” becomes obsolete. You can use the process described below to train yourself to allow emotional experience. It involves focused abdominal breathing, relaxation, paying attention to bodily sensations, recognizing the sensations as emerging emotions, and allowing the emotions to happen. It takes dedication and practice. The more you practice, the better you’ll get at it. I outlined the basic steps for focused abdominal breathing in my last article, titled Focused Abdominal Breathing to Reduce Pain and Anxiety. To use focused breathing for emotional contact and release, follow the basic steps and add a few more. Sit in a comfortable position with your feet on the ground and your back resting against your chair. Settle into abdominal breathing, beginning with a full exhale. Inhale, imagining that you are inflating a balloon that reaches from your navel all the way up to your chest. Your shoulders should not move, and your belly should expand with each inhale and contract with each exhale. Continue slowly inhaling and exhaling full abdominal breaths. As you exhale, press the balls of your feet into the floor. If you start to get light-headed, that means you are breathing too quickly. Slow it down. Inhale, exhale, and press your feet. Repeat. Continue breathing, keeping your attention on the sensations in your body. You may notice that you start to feel annoyed. You might even want to give up. If you feel this way, keep it up! That means the repressed emotions are starting to surface. Keep breathing. This is where surrender comes in. If you feel annoyed, frustrated, or like quitting or giving up, you’ll feel it somewhere in your body. Imagine breathing directly into those areas of your body that are feeling the sensations. Focusing your attention directly on the sensations and breathing into them allows them to expand. If you stay with the process, your body will gradually begin to cry in sadness, hurt, or anger. If these emotions begin to surface, surrender by allowing them to happen. They won’t last forever. When they’re out, you’ll feel lighter and calmer. Repeat the process. Remember you are teaching your body and mind something new. You may not feel anything the first few times. But if you keep at it, your body will gradually relax enough to start the process. You will probably experience many thoughts intruding into your mind. That’s okay. Just imagine each thought is contained in a bubble, and watch it float away on the wind of your breath. Then bring your attention back to your breathing. The more you practice focused breathing, the fewer thoughts will intrude on your session. Whether you are using focused breathing to clear emotional energy, ease pain, or just relax, it is good for your brain and body. The more you practice it, the better you get at it and the better it is for you. Aim to practice every day. Sometimes there are so many impacted emotions that a little professional help and support may be beneficial. A trained counselor can support you through this process. Don’t hesitate to ask for help. Sometimes I find I am much better if I just learn to embrace it instead of always trying to avoid it. I try to avoid it and it always creeps back up on me. But if you embrace, it, realize that it’s there and commit to dealing with it, then you go ahead and do all of the hard work to put that negative energy to rest. I guess that I sensed from a young age that no one wanted to see my feelings in action so instead I chose to keep them all on the inside instead of letting them all out. I suppose this has been my go to method of coping for so long now that I really didn’t know that there could be another way for me. So what you are saying is that if I would learn to deal with all of my other emotions in a better way thne I amy not have all of this other residual anxiety in my life? That sounds like a great plan so how do I get started working on that? What many of us fail to remember is that this is not normally something about ourselves that we can chnage overnight. Most of us have been holding back and hiding our emotions for a very long time, so what makes us think that we can change years and years of behavior in one day or one week? I think that the one thing that stood out to me is the need to practice. You may not get it right the first time or even the 31st time but eventually if you give it the time and energy that you have given to the negative things in your life, YOU WILL GET THERE. naturally that which we fight against so much is the thing that is usually going to be the biggest thorn in our sides. re: Gabby – Your’re right! The more you fight anxiety the worse it gets. If you lean into it with your breathing and grounding skills, it will start to drop away. Sure it’s uncomfortable for a few minutes, but the better you get at breathing and grounding, the easier it is to get through the storm. Anxiety is like a thunderstorm, it builds, rains down, and then clears away. Breathing and grounding practice helps us get through it and move on. Thanks for your comment! re: Dale – Yes, basically that is what I’m saying. 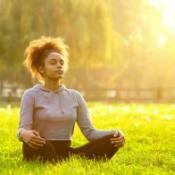 Start by learning the focused breathing skills and the grounding techniques. I explain more in detail about breathing and grounding in my article Two Essential Self Calming Skills. Mental manipulation techniques can also be helpful as I explain in my article Feeling Anxious? Turn It Down. Remember, these are all new skills you’re learning and you will need to PRACTICE them over, and over, and over, and over again. The more you practice, the better you’ll get. It’s like any other mental/physical skill. You have to practice to teach your body new cellular memory. And sometimes, having a guide/coach can help. A good therapist can help you learn these skills and can help you discover any hidden negative messages running around in the background of your mind. re: Alana – Exactly! Practice practice practice!! These skills take lots of practice to teach our bodies cellular memory. It’s like learning to dance, or play basketball or any other physical/mental skill. The more you practice the better your body remembers how to do it and can get grounded and calm more easily. Thanks for your comment! I know in my heart that this makes sense but I think that I would be scared to go to this place and work on my breathing and working through it instead of hiding and walking away. I am a big chicken and hate confrontation and even just thinking about it makes me hyperventilate a little bit. Yes, it’s clear I have issues. Deanna – I appreciate your openness and am sorry for your deep suffering. I encourage you to be aware that a competent therapist will NOT plunge immediately into your scary places, but instead will help pace the work so you have both a good therapeutic relationship and a foundation of noninvasive self-balancing/regulating skills in place before moving into deeper issues. I wish you all the best in your journey. Don’t give up! Thank you Becki for this great article. How can I access the other articles that you mentioned in your post? I live with anxiety even though I’m on Prozac and have been to therapy. I grew up with criticism, illness of a parent, and being ignored. Now I worry about the boss not approving of me. What can I do? It’s true that this kind of work can be very scary and hard to do on your own. That’s why its so important and can be so helpful to find a good therapist to be your guide and support while you work through these issues. It’s a big first step but can be SO worthwhile and transforming. and go to the bottom, you will see a list of all my articles. Did you address your issues with your parents in therapy? Or was it all cognitive therapy? Cognitive therapy is great, but sometimes we have to go back and heal our issues with the way our parents treated us. That way we can teach our bodies and minds both that the current people and situations ARE NOT our parents and we can learn to respond differently. Try to find a therapist who combines psychodynamic therapy with body work and cognitive therapy. That way you can learn to retrain your body and mind at the same time. Becki- Thanks for giving voice to the usefulness of other therapeutic approaches. Especially with early wounds, the much-acclaimed and frequently useful CBT/cognitive approach is not the only tool in the counselor’s toolbox. This breathing technique is useful when you’re training your mind to focus on something, not in the expression of strong emotions. When you can focus on your breathing, it is because you’re calm enough to do so!! But there are times when emotions have TOO MUCH energy to be spent just by simply breathing, esp. when you’re not used to controlling the mind. I have found that anger energy, for instance, is better spent by running hard, pounding the dirt when gardening, imagining who I’m mad at and punching him/her in the air in a TurboKick class. At the gym, there are weighted balls that you can throw to the ground, and it feels great to throw them as hard as I can. Even if the energy doesn’t subside for the whole day, it doesn’t stay – I might feel lighter the next day. When I feel profound sadness, I allow myself to cry it out. I might hug a pillow, or myself. I’ve even bought myself a toy that i really loved as a child, as a way to give my younger self that kindness that she wanted. It also helped that I sent letters/emails to all parties involved expressing exactly what i remember, and how I felt as a child. Even if I am now viewed as “disrespectful,” I really don’t care! I’ve stated the facts, and I’ve acknowledged the elephant in the room. That makes me feel better. And the people that genuinely understand that my words and emotions needed to come out – those that didn’t react and judge, but listened – will forever hold a special place in my heart. Maybe some relationships were damaged, but they are further confirmation to me that some people really aren’t worth keeping. And that is perfectly okay, no matter who they are. But I know I cannot allow myself to stay in that state of mind where I’m CONSTANTLY reliving the past and emotions. I allow myself to remember and express the emotions, and THEN I remind myself what the date is. it is to consciously remind myself that what happened in the past is no longer happening – I am safe, I am loved & I am supported. I have sufficiently distanced myself from that dangerous place. I remind myself of the good things I have now, and it is at that moment when I can truly appreciate not just the people who helped me flourish, but as well as the only person who loved me enough to fight for me – myself. Lastly, it is helpful to ask, “What is the result that you’re trying to achieve?” For instance, what is the result I want when I have a strong urge to send an angry email? Is it to reveal the truth that’s been hidden my head, or is it really a warning step for revenge? Will this action result in what I want, which ultimately is a different past. When I can honestly tell myself that this action will never change the past, then I realize that the action is useless.